Meantime, based in Greenwich, have been on my list of places to visit for a lot longer than I’ve been blogging. The first of the new wave of London breweries, they’ve been in operation since 2000 and moved to their current site ten years later. 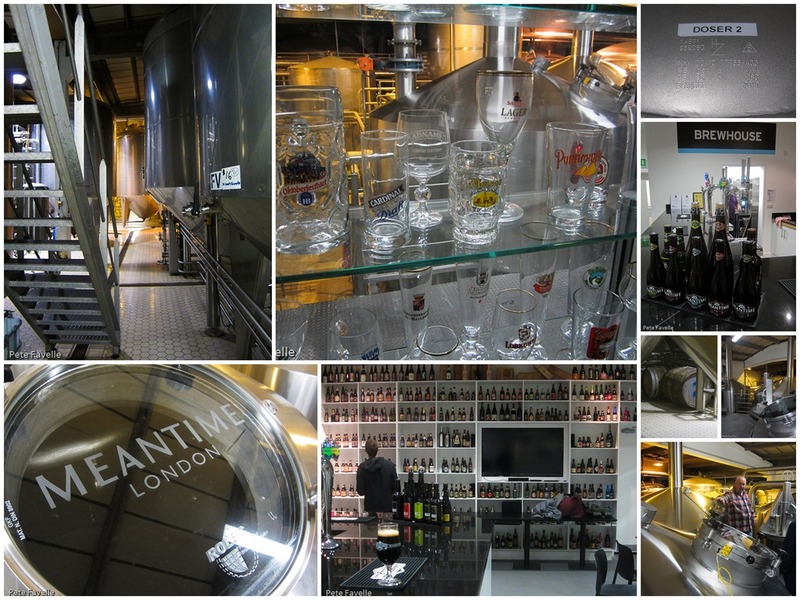 In common with many London breweries, they’re based in a fairly anonymous building on an industrial estate. The only clue to its purpose as a brewery are the big new grain silos waiting to be plumbed in, which allow them to take their pale malt in bulk form rather than sacks. The visitor centre has a bar looking out onto the brewery proper; the walls are filled with an impressive range of bottles and glasses that turns out to be from the late Michael Jackson‘s personal collection – as we wait for the tour to begin we entertain ourselves by spotting how many old favourites are on display. The brewery itself is impressive; filled with acres of stainless steel and comfortably the most hi-tech looking brewery I think I’ve ever seen. Half that steel is for the fermenters – there must be two dozen – and the rest is a similar number of maturation tanks: 40,000 litres worth! Our host Rod Jones – Meantime’s in-house Beer Sommelier – explains that this fantastic volume is needed to allow Meantime to mature their beer for 4-6 weeks, although some of their beer, including the new seasonal beer, Bohemian Dark, is allowed to age for months rather than weeks. It’s the Bohemian Dark that we’re here for, and we’re the first folk from outside the brewery to get a taste. Living out in the wilds of North London, it’s easy to think of Meantime as just producing a beautifully crafted but fairly static range of bottled beers. However, their draft range is far more dynamic – their seasonal beer changes every two months, and in addition to that they have special brews (like the Weyermann Porter that was released – and sold out! – the previous weekend) and a ‘Brewers Dozen’ program showcasing a new beer every month this year. To taste them, you need to head to one of the handful of pubs lucky enough to get their hands on these – or better still, to Meantime’s own brewery tap, the Greenwich Union. 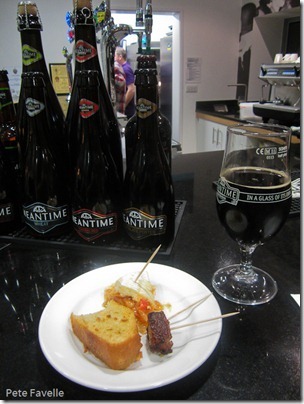 Bohemian Dark (best enjoyed, as here, with some tasty Bohemian snacks!) is described as a black lager “inspired by traditional Prague beers”; a dark beer that’s best summed up as a cross between a lager and a porter. Fresh and clean tasting with an almost champagne-like gentle fizz, it has a gentle but distinctly toasted malt flavour without any notable sweetness and a finish which has a refreshing, almost tannic dryness to it. In many ways it’s a shame it’s a seasonal beer, because I can see a nicely chilled Bohemian Dark being an excellent drink for a warm summer evening. Maybe we’ll get lucky and Meantime will decide to add it to their core range! 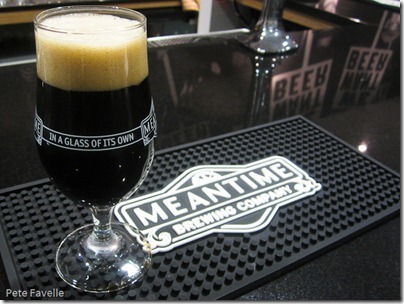 Pete Drinks was a guest of Meantime – thanks very much guys.